Rainy Ridge Lake is located in the Castle Special Management Area in the Southern Alberta Rockies. 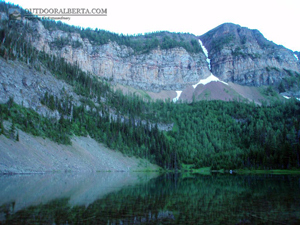 Accessing this lake can be difficult with one access over a pass from BC and the other from an ATV trail along the West Castle River. I have never tried the BC access but if you are planning to get up from the ATV trail I highly recommend you try to find the right trail. Follow the road passed Castle Mountain Ski Resort and then head up the ATV trail to the left (where there is the one and only sign for Rainy Ridge Lake) to the ATV bridge a few KM's down. Head down the ATV trail from this bridge for about 15 minutes (walking speed) or so until you reach a vague trail into the bush on the right (or another a few meters down the trail). From here you must head almost straight up a mostly overgrown trail most of the way up the mountain until you hit some steep rock where you will find a decent trail (with a bit of tree fall) going north. This trail takes you along the base of the rocks and then around to the lake. I give you these directions in the hopes you don't attempt the bushwack from the ATV bridge as this was very rough making my first time Golden Trout experience a memorable one. The lake itself is clear and not too deep as you can see the bottom on a sunny calm day. 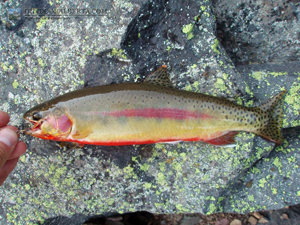 The Golden Trout in Rainy Ridge Lake are naturally reproducing in the outlet stream. The size of fish in this lake does not seem to be bigger than 11 or 12" with most caught in the 10" range. They were fairly aggressive in this lake at least at the peak times of day. 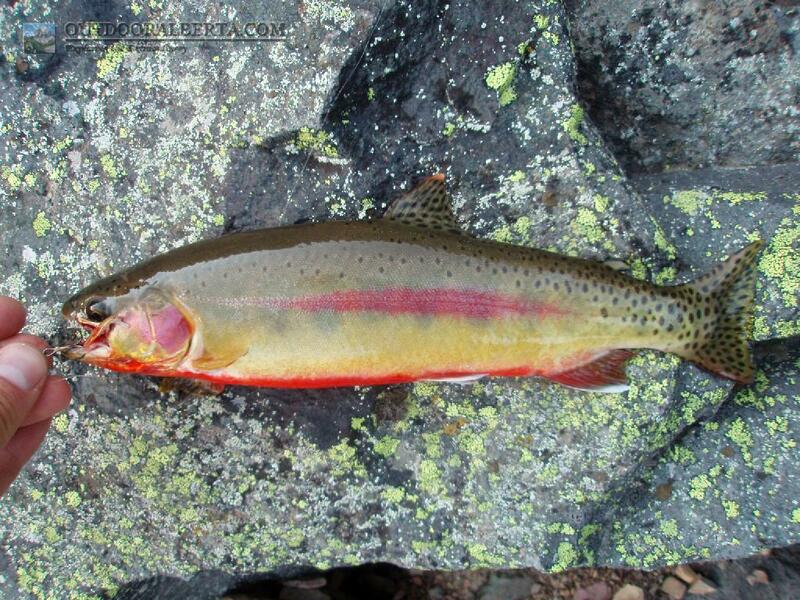 Sight fishing for these Golden Trout is possible and they do often head into the shallower waters near shore. 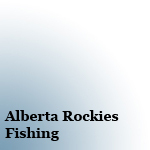 The deeper water off the rocks is where the best fishing was.